Are You Moving to Arizona? You're Not Alone! 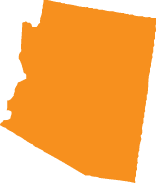 No matter where you decide to live in Arizona, Movearoo can help you find the best deals from top home services providers! We’ve sifted through the stats to track down the Arizona providers that offer the fastest Internet speeds. Arizona boasts average Internet speeds of 33.1 Mbps, which means there’s a good chance your new home can enjoy the fast Internet connection you need. Looking for a great deal on TV, Internet, and phone service for your new Arizona home? Movearoo is here to help. We’ll show you the top deals from the telecommunications providers in your area. Movearoo also helps you figure out which bundles and packages will help you save the most money on your monthly bills. In addition to saving time and money, you’ll get direct access to a variety of resources exclusively from Movearoo—like checklists and guides—to help you take the stress and frustration out of moving.